Fat LossHi Tec Thermo Fusion - 120 kaps. REDUCES THE FEELING OF HUNGER. HAS A POSITIVE EFFECT ON MOOD. REMOVES EXCESS WATER FROM THE BODY. 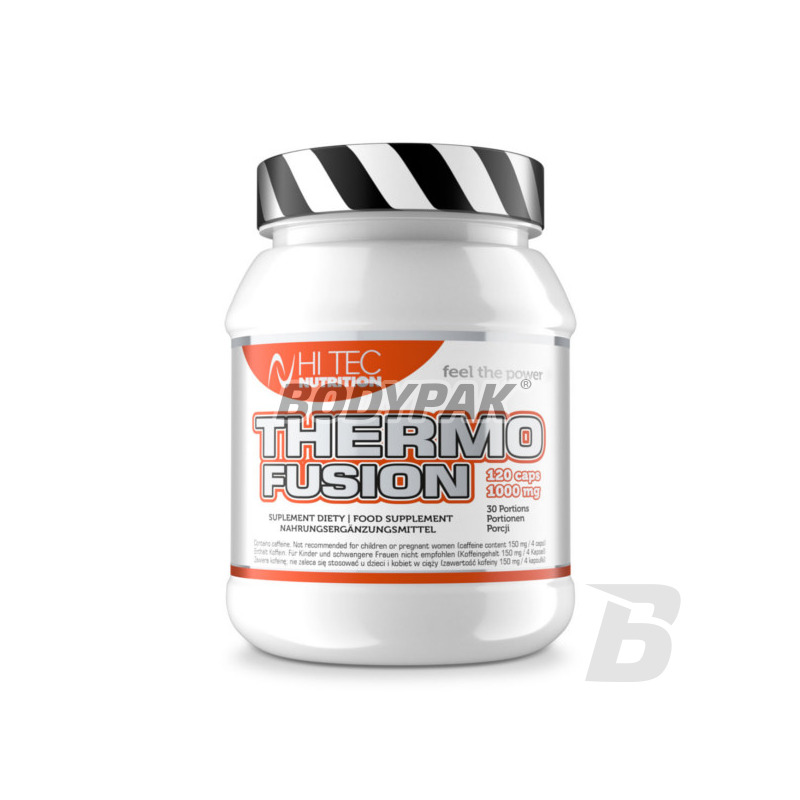 Hi Tec Thermo Fusion is a strong and very effective preparation FAT Burner, which effectively and quickly helps fat loss in the body and inhibits its re-accumulation, which prevents the yo-yo effect. Green tea polyphenols inhibit the degradation of synephrine, which further exacerbate the breakdown of fat, and caffeine significantly extends their activity in fat cells. Used L-carnitine is essential to maintain the rapid pace of metabolism during weight loss. Along with HCA for efficient fat burning with a minimal reduction of the number of calories Increased production of heat in the body preparation has been enriched with ginger extract known for its thermogenic properties. Ginger has warming the whole body, stimulates circulation, helps digestion and accelerates fat burning. Applied capsaicin and piperine stimulates the process of heat production in the body. The composition of natural bioactive components of thermogenic synergistic action. Enhances the breakdown of fat and fat burning to the dispersion of thermal energy and suppresses appetite and fat accumulation reserve. Thanks Tremo Fusion strongly stimulates the metabolism, burns fat, improves the effectiveness and efficiency of training. Ingredients: L-tyrosine, green tea extract (leaves), guarana extract (seed) extract, Garcinia Cambodgia (source HCA), a capsule (gelatin beef, colorant: titanium dioxide), caffeine, L-carnitine tartrate, root extract ginger, anti-caking agent - magnesium salts of fatty acids, chilli pepper, black pepper. Robi co ma robić... nie ma zjazdu po nim .. nie jest za mocny, ale też i nie za słaby.